KINGS of THRACE. Lysimachos. 305-281 BC. AR Tetradrachm. Pergamon mint. Luster. Superb portrait. KINGS of THRACE. Lysimachos. 305-281 BC. AR Tetradrachm (27m,, 16.87 g, 12h). Pergamon mint. Struck circa 287/6-282 BC. Diademed head of the deified Alexander right; K below neck / Athena Nikephoros seated left; cult figure to inner left, crescent in exergue. Arnold-Biucci, Pergamene 76; Thompson 228; Müller 289; SNG Copenhagen 1100. A superb portrait from the famed Pergamon mint. Lustrous with golden highlights. KINGS of THRACE. Lysimachos. 323-281 BC. AR Tetradrachm (31mm, 16.58 gm, 12h). Lysimachia mint. Pedigreed. Superb. KINGS of THRACE. Lysimachos. 305-281 BC. Æ Unit (18mm, 4.54 gm). Kings of Thrace. Lysimachos. 305-281 BC. 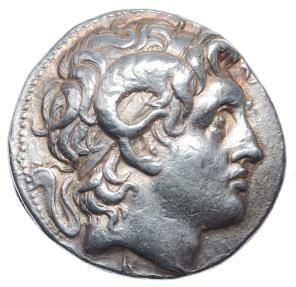 AR Tetradrachm (16.72 g, 31 mm,12h). Magnesia ad Maeandrum mint.